One of Iran’s most contentious nuclear sites is the Fordow enrichment plant buried deep under a mountain, near the city of Qom. Few believe that this site, constructed in secret, was intended for solely peaceful uses. In the upcoming negotiations between Iran and the P5+1 aimed at reaching a comprehensive solution, the closure of this site will be a priority for the United States and its allies. The International Atomic Energy Agency (IAEA) has evidence that construction of this gas centrifuge plant started at a time when Iran should have declared it to the inspectors. In September 2009, U.S. President Barack Obama, French President Nicolas Sarkozy, and British Prime Minister Gordon Brown revealed the facility publicly. 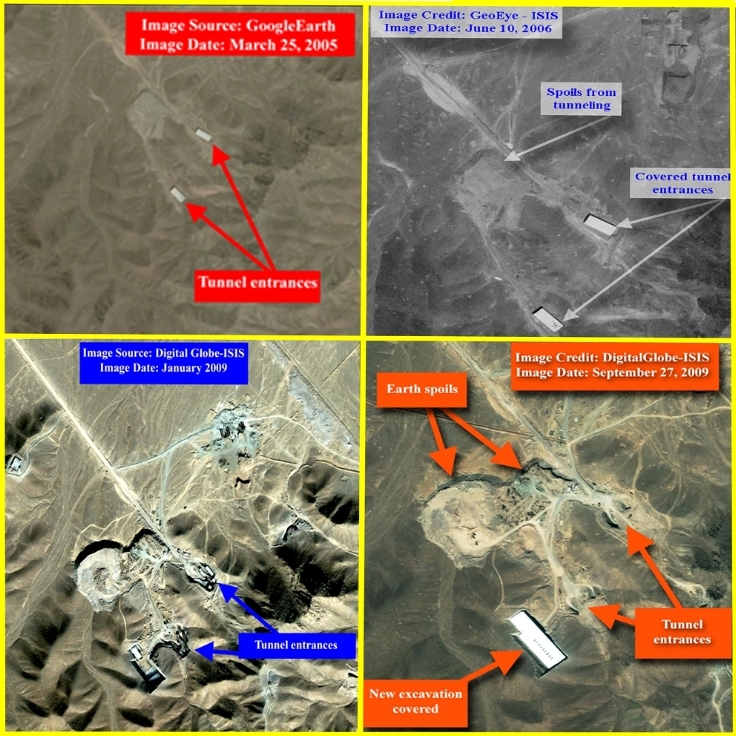 This revelation showed that Iran continued to build nuclear sites in secret, despite its frequent denials that it would not do so anymore. It had built several before 2004 but stated that it would be more open about site construction in the future. The result of this revelation was that Iran’s credibility was severely hurt and suspicions have remained strong that Iran will build another enrichment site or other nuclear plants in secret. Recent commercial satellite imagery shows the aboveground parts of this facility. As figure 1 shows, the visible parts of the facility consist of three major tunnel entrances that lead to the underground enrichment halls, one building, and a well-defined security perimeter surrounding the site. Figure 2 shows the evolution of the site between March 2005 and September 2009. In 2005 and 2006, the initial tunnel entrances and tunneling activities were barely visible because they were covered for construction purposes. However, in 2009 the tunnel entrances, as well as earth spoils caused by tunneling activities, were clearly visible. Additionally, in 2009, a building (bottom left of figure 2) appeared west of one of the tunnel entrances. Although the underground halls holding the centrifuges may survive a military strike, the tunnel entrances and key facilities on the surface providing ventilation and electricity would not. As a result, centrifuge operations are not immune from being shut down by military strikes. 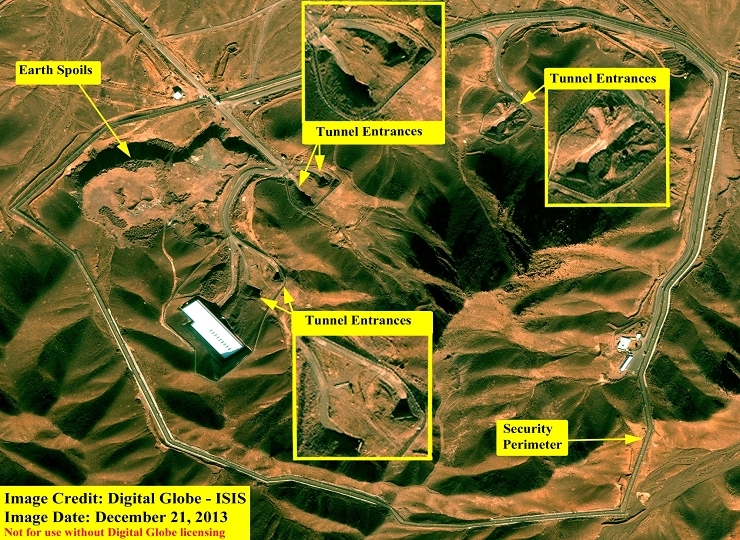 After the centrifuge site’s revelation, Iran made modifications to the enrichment equipment and changed several times its declaration to the IAEA about the centrifuge plant’s purpose, as a 2012 ISIS Report highlights. Iran’s confusing actions increased suspicions that the original, unstated purpose of the plant was to make weapon-grade uranium for nuclear weapons. In the end, Iran installed approximately 2,700 first generation IR-1 centrifuges in two halls, Units 1 and 2, each designed to hold 8 cascades of 174 centrifuges per cascade. According to the IAEA Safeguards Reports on Iran, Iran has operated 696 of these IR-1 centrifuges in four cascades of 174 IR-1 centrifuges each that are organized in two tandem sets to produce near 20 percent low enriched uranium. Under the November 2013 Joint Plan of Action, Iran has agreed, as an interim step, to stop making near 20 percent LEU at Fordow and to undo the piping connecting the tandem cascades. It has further agreed not to feed uranium hexafluoride into the other 12 cascades, which would remain in a non-operative state. Additionally, Iran has agreed not to install any advanced centrifuges at Fordow. However, during the period of the interim deal, Iran can make LEU enriched below five percent in the four cascades organized previously to make near 20 percent LEU; a step it apparently intends to take. If any IR-1 enriching centrifuges break at Fordow, Iran can replace them only with centrifuges of the same type. Iran foreshadowed difficulties in implementing the interim deal during the December 2013 negotiations of the implementation of the interim steps. It tried to push the boundaries of both the meaning of the phrase “broken centrifuge” and even tried to argue that a “same type” could involve something different than the IR-1 centrifuge. The definition of “broken” matters since Iran could exploit this provision to build up over time a secret stock of IR-1 centrifuges outside of IAEA monitoring. The P5+1 resisted these and other efforts to create loopholes in the interim deal, according to a European official knowledgeable about the negotiations. The implementation deal announced on January 12, 2013 appears to have settled these issues satisfactorily. But a lesson is that the IAEA will need to carefully monitor the removal and installation of centrifuges at the Fordow and Natanz centrifuge sites to ensure that removed ones are indeed broken and that new ones are of the same type, namely identical IR-1 centrifuges. In the coming months, Fordow will likely become a more contentious issue. As part of Iran resolving all of the IAEA’s concerns, Iran will need to clarify Fordow’s original construction schedule as well as resolve the IAEA’s concerns that its original purpose was military in nature. In terms of arriving at a mutually defined enrichment program under a comprehensive solution, U.S. officials have stated that Fordow centrifuge plant will need to close. Iranian officials have publicly resisted this option but privately have acknowledged that Iran would consider an end to major centrifuge operations at Fordow. In the end, a key demand will be that this site close down, which includes the removal of all centrifuges and related infrastructure. Figure 1. Digital Globe imagery showing the Fordow Fuel Enrichment Plant in December 2013. Figure 2. Google Earth/GeoEye/Digital Globe imagery showing the evolution of the Fordow Fuel Enrichment Plant between March 2005 and September 2009.